EIN (Federal Tax ID): Federal law requires that all financial institutions establish and implement a Consumer Identification Program in order to verify the legitimacy of any entity that is attempting to set up any financial account. 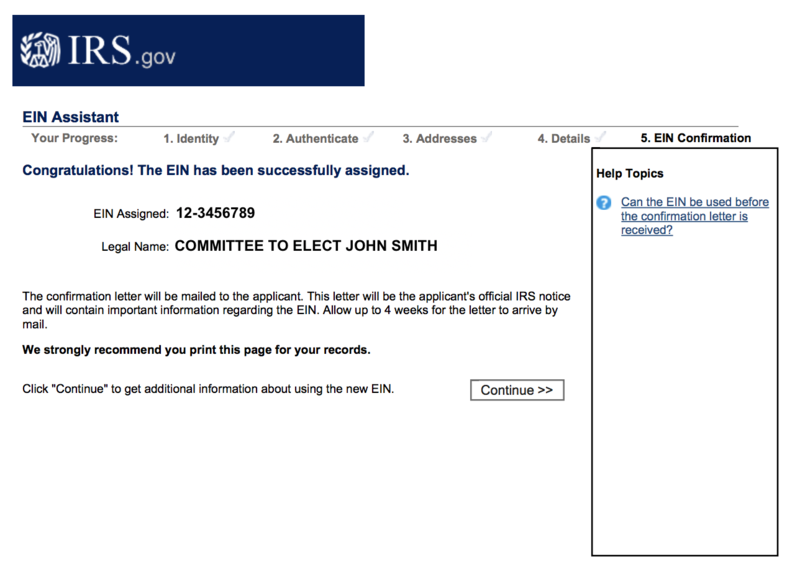 If you do not have an EIN, obtaining one is free and you can apply at the IRS website — it only takes a few minutes! Setting up a merchant account will require an authorized representative from your committee to sign a set of agreements with ActBlue and Vantiv Worldpay. You can get this process started by filling out our Merchant Account Setup Form, where all of the necessary information and documentation can be submitted! After all of the documents are submitted to us, you will receive an email from HelloSign, a secure and legally binding signing service, with instructions on how to electronically sign your agreements. When the agreements are signed, ActBlue will automatically receive a copy. Once all of the setup materials are submitted and signed, it can take up to 7 business days for your merchant account to be fully set up by Vantiv Worldpay, so it is to your advantage to gather and submit all of your setup documentation as quickly as possible. There’s no downside to getting your account set up in advance, even if you’re not sure when you’ll need to start fundraising! Not ready to announce your campaign publicly yet? We're able to discreetly and privately set up your account so that as soon as you’re ready to make your big announcement you can begin fundraising immediately! Vantiv Worldpay is bound by very strict regulations and thus can only proceed with the merchant account setup if the following documents match their requirements exactly. You will be prompted to upload images of the following documents as you proceed through the Merchant Account Setup Form. Submitting a document that does not meet Vantiv Worldpay's requirements will trigger an error and delay the processing of your merchant account application. Please do not submit the Merchant Account Setup Form until you have such documents. Because Vantiv Worldpay will be transferring the funds directly to your committee’s bank account, they need to make sure they have all of your correct banking information. To verify your bank account, we will need you to upload a document from your bank confirming the information. You can find examples of acceptable bank documents below. The uploaded image must include the entire check, and all of the text must be legible (see example below). Your committee name (or Doing Business As name) must be indicated as the name associated with the account. Full bank account number must be printed on the letter (not handwritten). 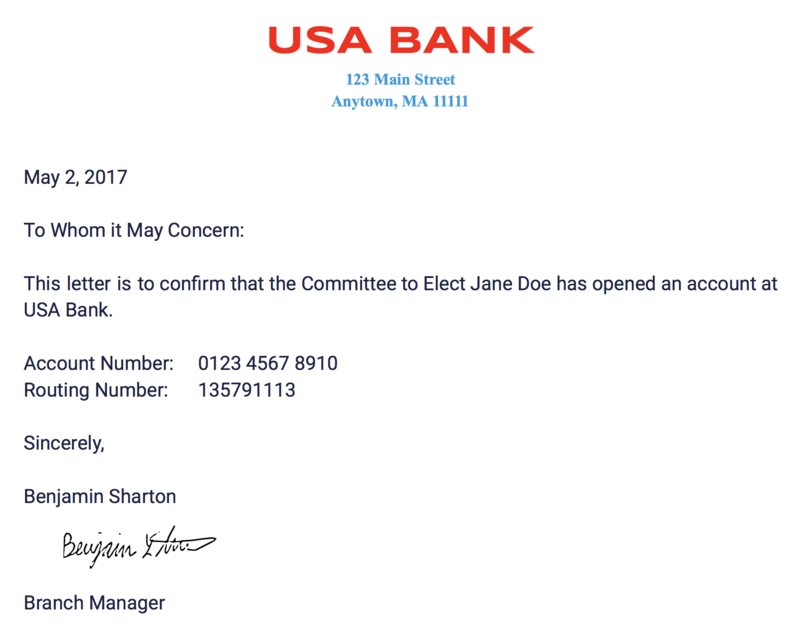 Full bank routing number must be printed on the letter (not handwritten). The uploaded image must include the entire letter, and all of the text must be legible. Because the IRS does not update its database in real time, we may not be able to verify your EIN if it was established within the last 6 months. If you recently obtained your EIN, our Merchant Account Setup Form will prompt you to upload a document from the IRS confirming they issued the EIN to your committee. If your EIN is long-standing, you will still be given the option to upload a document. Uploading the EIN document is helpful in expediting the setup process but not mandatory for long-standing EINs. Please note that if you are not prompted to upload an EIN verification document, we will verify your EIN information using the IRS database. If we are unable to do so, we will reach out immediately to let you know that we will need you to provide one of the below EIN verification documents. When uploading this document, please make sure it falls under one of the three document types listed below and meets all requirements. 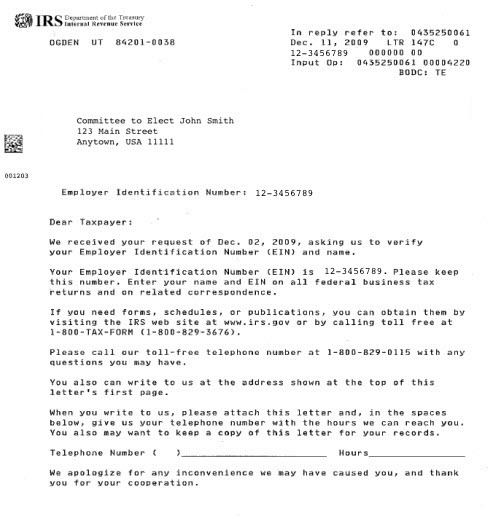 A satisfactory IRS Letter SS-4 must include the first page of the letter itself (see example below) — the cover page alone is insufficient. 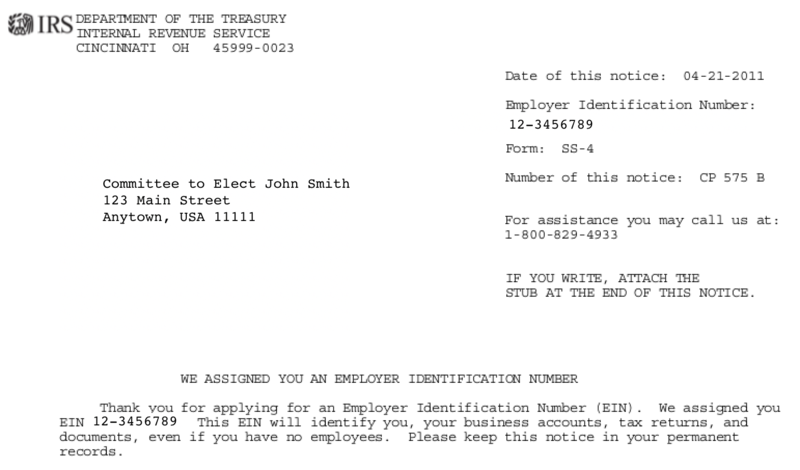 Please note that this IRS Letter SS-4 is distinct from the IRS Form SS-4, which is the paper form used to submit an EIN application to the IRS. A satisfactory IRS Letter 147C must include the first page of the letter itself (see example below) — the cover page alone is insufficient. If your EIN was obtained online, Vantiv Worldpay will accept a screenshot of the website page that confirms the EIN was issued (see example below). Please note that when an EIN is obtained online, the IRS will also provide a PDF copy of the SS-4 (as seen above), which is the recommended form of verification.